Dinh Q. Lê's 'Erasure' is an interactive sculptural exhibition which critically interrogates the notion of the migrant via a video piece and a huge collection of abandoned photographs the artist bought from second hand shops in Ho Chi Minh City. 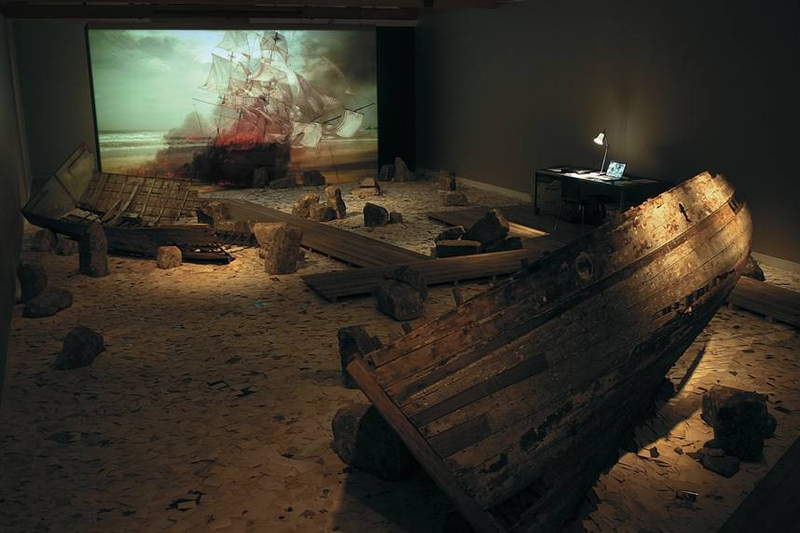 Originally commissioned by the Sherman Contemporary Art Foundation in Sydney, and since exhibited in Hong Kong, the project was conceived in response to the tragic deaths of asylum seekers, whose boat crashed on the shores off Christmas Island, an Australian territory, on the 15th of December 2010. 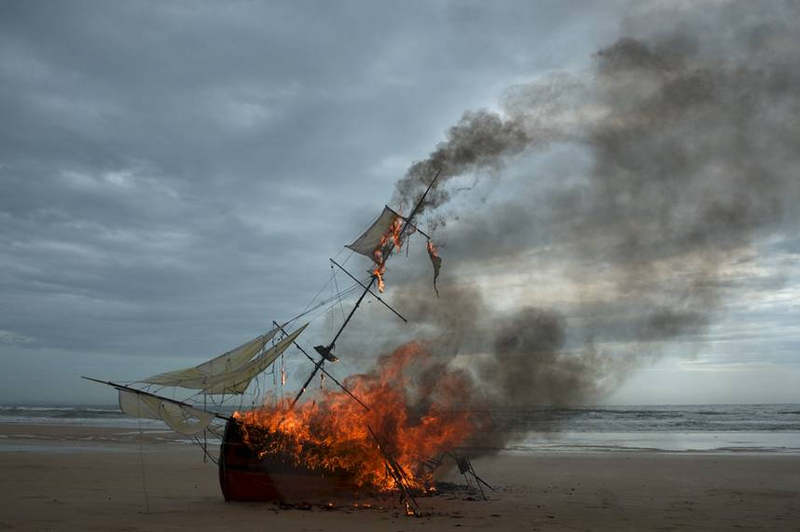 Lê's response to this disaster, which is harrowingly captured in an anonymous Youtube clip, is a short video of an old European style ship burning on an empty beach. The point here is clear: Lê suggests that the notion of so-called 'boat people' is a culturally specific construct that changes throughout history. Italian immigrants to America, French immigrants to Canada or British immigrants to Australia - these people originally arrived by boat. In contrast to the stoicism and even heroism attributed to European migrants, the 'boat people' in today's globalized word - Afghans, Iraqis, Pakistanis, Sudanese, Somalis and so forth - are viewed with anxiety and suspicion. Dinh Q. Lê, Erasure, 2011, detail (video still). Commissioned by Sherman Contemporary Art Foundation. The main element in Lê's 'Erasure' are thousands and thousands of abandoned photographs scattered on the floor of the gallery. The immediate association of walking into the gallery space on wooden planks is that these photographs create an 'ocean of memories'. The visitor is actively encouraged to reach into this ocean, touch and look at these forgotten photographs. As the images originate from Vietnam, many of which are portraits dating perhaps from the 1950s to the 1970s, Dinh Q. Lê's own background is incorporated into the exhibition: born in 1968, Lê's family emigrated to the US in 1979 as a result of what is termed the 'American War' in his country of birth. A crucial aspect of the exhibition is that visitors are invited to pass photographs of their choice to a gallery assistant who scans the work for an internet archive set up by Lê. Here, the exhibition, and the visitor's response to the exhibition, metaphorically seeks to bring back memories signified by the old photographs. Yet this project is not about nostalgia or memory in a romantic sense, but rather, in conversation with the burning boat video, the project highlights the tragic cost of migration: the abandoned photographs signify the prize of leaving behind family members, and with that, also leaving behind memories. As the thousands of photographs on the gallery floor indicate, the emotional and psychological cost of migration is immeasurable. Marco Bohr is a photographer, writer and founder of visualcultureblog.com.